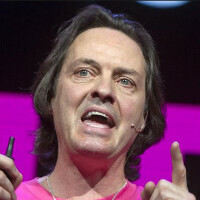 T-Mobile CEO John Legere has made a list of his wireless predictions for 2015. The executive expects 67% of new phones to be sold without a subsidy in 2015, up from 41% sold in that manner this year. T-Mobile was ahead of the field on that change. But Legere says that other improvements instituted by T-Mobile aren't going to be as widely put into play by the other carriers. He still expects overages to be paid by many customers of other carriers, along with ETFs. Another prediction made by T-Mobile's CEO for 2015, is that his network will go head-to-head with Verizon almost everywhere in the country, and win when it comes to measuring network speed. While T-Mobile covers 264 million people with its LTE at present compared to the 303 million covered by Big Red, Legere says that T-Mobile's LTE coverage will cover 300 million people this year. 150 metro areas will be covered by Wideband LTE and 700MHz spectrum will cover 350 such locations. The latter offers signals with better indoor penetration, and travels longer distances. And T-Mobile's LTE service has already been called the fastest in the states. Legere expects AT&T to offer a "weak" version of T-Mobile's Data Stash, which allows T-Mobile subscribers to roll unused data minutes over to the next month. He also predicts that AT&T will collect more money from customers for data overages than any other carrier. As for Sprint, Legere sees the mobile operator "throwing out campaigns, offers and promotions – anything to see if it sticks." He says that Sprint will eventually discover that it can't slash prices, add customers, and have enough scratch left to upgrade the network. As for Verizon, the executive expects to see more "BS promos" from the nation's largest carrier, including coverage maps. For 2015, the T-Mobile CEO says that wearables will go mainstream, led by the Apple Watch. He also expects a big year for phablets. And yes, John Legere says that in 2015, T-Mobile will pass Sprint to become the third largest carrier in the U.S. This was something that Legere had earlier expected to take place during Thanksgiving. But it should take place in 2015. "It's a done deal," the CEO promises. Fix your coverage then we can talk. Ditto!!!! Cause right now, can't hear you. Sorry, no bars present. Pass Sprint? That's aiming pretty low. That's like BlackBerry trying to catch Windows phone. Or is it the other way around? If you live in an urban area and don't travel through the country much, T-Mobile is a no brainer for you. Any geek that checks these two conditions has got to switch. I'm in NYC and had T-Mobile for a couple of months this year (June - November to be exact), and I've never had so many dropped calls in my life. I had to get off of their network. It's still spotty and inconsistent. I'll try again at some point next year...maybe. I live near a large metro still sux; is more about signal penetration if anything. Good luck, l the best. I'm not sure of the significance of third or fourth at this point. What difference does it really make? They are about equal at a huge deficit from first and second. It won't phase the big two. A race of the weak and struggling does nothing to upset the leaders. John B.
I'm happy with T-MO.. I get a good 21mb when im out..around 15mb at home. Their new plan (2 lines for $100 w/unlimited 4glte) is super dope. Their customer service is actually tolerable. I wouldn't switch for anything. I don't think it will be too difficult to surpass Sprint this year. I'm pretty sure Sprint has given up on their network. They have that fake "cut your bill in half", which only cuts the cost down 20%, but they still have the slowest speeds across the country. Wow....aiming quite low. Why does tmobile think they are in the same class as verizon and att? Combined witj sprint they couldn't compete. Tmobile has NO rural coverage, if you travel a lot, you're screwed!.